The 75 mm Gun Motor Carriage M8A1 is a gift Rank I American tank destroyer with battle rating of 2.7. 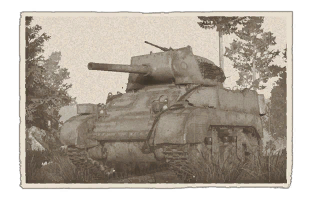 It was introduced in Update 1.45 "Steel Generals", along with all other American tanks, but wasn't available until Winter of the 2014. An upgunned M8 Scott armed with 75 mm M3 gun, it's a light tank destroyer capable of flanking & destroying enemy tanks at the same time with its outstanding mobility. Suspension bogies and wheels are 15 mm thick while tracks are 10 mm thick. Tracks laid out on the turret side give an additional 10 mm of armour where they are stacked. Sandskirts on the bottom hull give additional 5 mm thickness. Ammo racks of the M8A1 GMC. This vehicle plays along with the American concept of the tank destroyers, fast and powerful, but lacking in armour. Using the terrain for cover is necessary to survive against the enemy shells, plus constant repositioning is needed to keep the enemy guessing where the M8A1 is located. However, if able to get the jump on the enemy, the 75 mm gun on this vehicle can destroy the vehicles at its rank and the addition of the .50 cal M2 Browning on top aids its versatility against lightly armoured vehicle and aircraft. Multirole (tank destroyer / light tank role). 75 mm M3 gun taken from M4A1 Sherman, strapped onto M5A1 Stuart tank form. Can easily destroy every tank it faces. Reaches top speed (56 km/h) relatively fast. High acceleration (42 km/h) for a light tank carrying 75 mm gun. Doesn't lose speed drastically upon turning. Flanks so well as a light tank (exactly like M5A1 Stuart). Decent turret traverse with Ace Crew up to 11.9°/s. .50 cal machine gun can eliminate low flying aircraft & speeding light tanks such as BT-7. .50 cal machine gun is low profile unlike many other American tanks, making it easier to hide. No ammunition is stored inside the turret. Commonly misidentified as short-gunned M8 Scott. Arguably equal to Panzer II H in every aspect. Considerably big for a light tank destroyer. Gun breaks down if the mantlet is penetrated. Below average turret traverse rate for an American tank. Light tank armour, cannot withstand hit. Open topped turret (which exposes the crew & ammo rack) can be barraged by artillery & airstrikes. All of its ammunition are stacked in every corner inside center compartment, single explosion in the middle of the hull can explode the ammo racks. Doesn't have APCR as the Pz. II for heavily armoured target or long range operation. Usually becomes a priority target when spotted due to its armament & mobility. In United State's entry into World War II, the troops in the front lines require a support vehicle similar to those in use by the German forces in the form of the StuG III. The project for such vehicle began as a design submitted in late 1941, which was a M5 Light Tank mated with a howitzer on the hull front, designated the T41. This design didn't pass as the howitzer on the hull sacrificed crew protection. The design was revised on the same M5 light tank and instead had the M5 turret removed and replaced with an open-topped turret similar to the US tank destroyers M10 and M18, which mounted a 75 mm howitzer. This change caused the hatches for the driver and assistant driver to be placed on the glacis front rather than the hull roof. This design, called the T17E1 HMC was approved and put into production under the designation 75 mm Howitzer Motor Carriage M8, or the M8 Scott. The 75 mm M2 howitzer was the initial armament of the M8 before switching to the updated 75 mm M3 howitzer on the M8A1 variant. The howitzer was capbale of firing smoke M89 or high-explosive M48 rounds, the vehicle could hold 46 of these 75 mm rounds. The M8 does not have any machine guns on the coaxial or hull-mounted area, but a .50 cal Browning was mounted on the rear right corner of the turret for infantry defense. The vehicle was put into production in April 1942 and continued until January 1944, of which a total of 1,778 units were produced by Cadillac only. These vehicles would go on to serve in the Italian Campaign, European Campaign, and in the Pacific in the hands of the US Army. The M8 saw use in American service until the M7 Priest 105 mm self-propelled gun could be fielded in large numbers, which stopped the M8 production and service in American units. After being phased out of American service, the M8 was then given to the Free French forces that use them in the Western Front of the European operations. The French continue to use them all the way to 1954 in the French-Indochina conflict in use by South-Vietnamese forces. Other users of the M8 included the Khmers national army, Laos, China, and the Philippines. The 75 mm GMC M8 was an unlockable gift vehicle from the "War Thunder Christmas Special" in 2014. The vehicle was made available again in the Warbond Shop as part of the War Thunder 4th Anniversary in November 2016 with a price of 2900 warbonds.